15kms drive south along the beach from from Rainbow Beach is one of Australia’s most phallic land forms – Double Island Point. 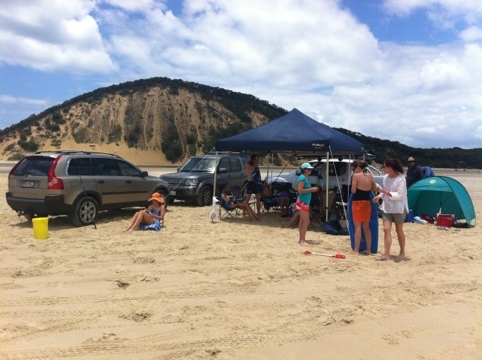 Double Island Point is 4WD heaven and each day hordes gather to fish, swim, surf, climb sand dunes, bush walk, beach drive and just lay about. It is where Tony from Toowoomba escapes each year for 3 weeks for the last 12 years. For the last 3 years, TfT has made the journey with family in tow from Beijing and a greater contrast you cannot find. When TfT hopped on the plane it was minus 10 in downtown Beijing and grey. 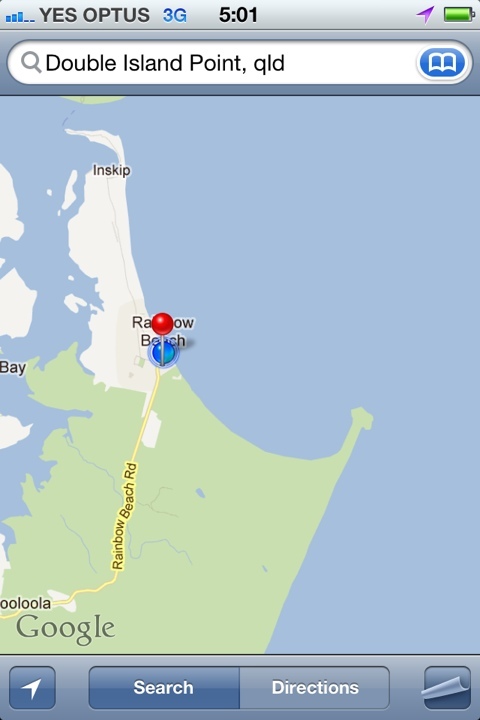 There’s no pollution at Double Island Point and the weather’s been a balmy 29 degrees most days. 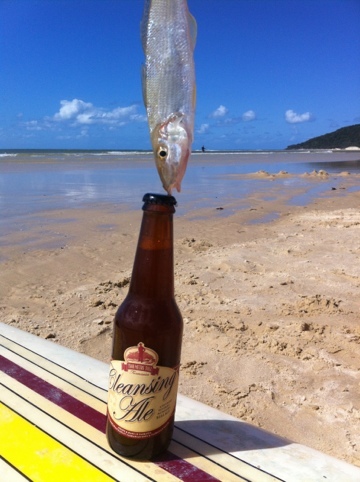 There’s nothing TfT loves to do more than set his family and friends up on the beach and then bait up, wade out into the 26 degree water and start fishing. He’s not bad at the caper either. He’s also a fine teacher and as separately reported, enabled this correspondent to catch his first fish – a mighty whiting. Not surprisingly, given TfT brings enough gear to set a village, an risky features prominently and we slipped z couple of uniques into amongst the ubiquitous XXXX. 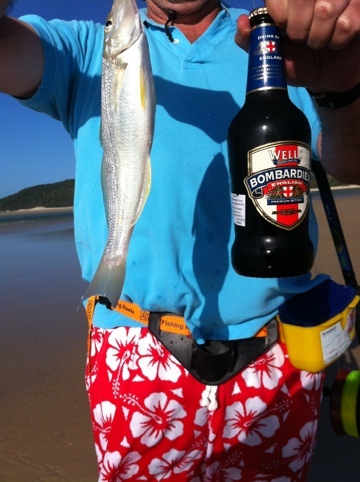 First up was a Chrissy present – Bombardier. This a great drop, but probably drunk in the wrong surrounds. Made lovingly by Charles Wells Ltd (part of Wells & Young) it is rich, complex real ale best enjoyed from a glass with a plate of English cheddar. Definitely one to revisit. At 500ml, one can’t have too many of these in the hot sun. 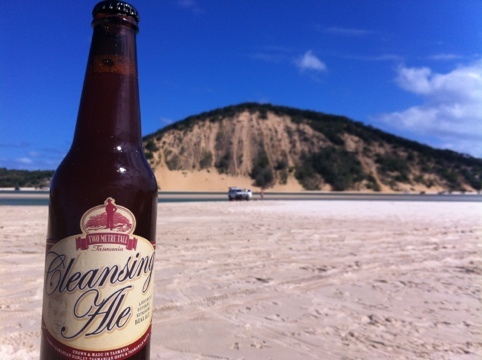 No less complex, but far better suited to the conditions was 2 Metre Tall’s Cleansing Ale. Cooled to perfection by TfT’s esky, this bottle conditioned real ale had plenty going on. I gave it a couple of “Coopers Rolls” to loosen the yeast sediment and was intrigued. There was a real malty home brew kind of taste but in a very good way. The mouth feel was also very enjoyable with good bubble and malt action happening. A six pack next time for sure. The name of the brewer, The Two Metre Tall Company, comes the height of the brewer himself who describes himself as brewing on the lunatic fringe. That’s harsh. He’s fanatical about using ingredients he grows himself, but there’s nothing mad about this beer. A beauty.